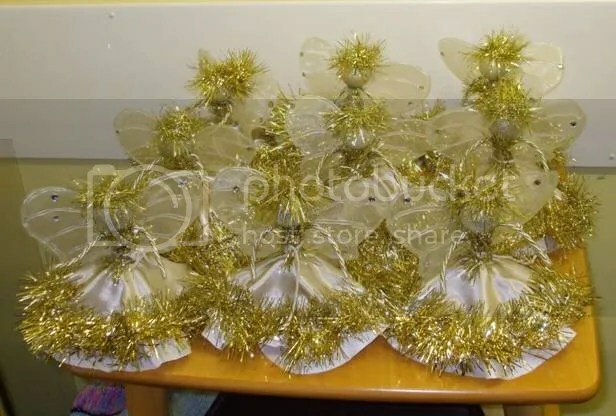 Well, my 3D craft workshop went down very well with the MENCAP group on Monday and we were able to make a veritable army of ‘tatty tinsel fairy’ clones – 19 in all. Everybody was really proud of themselves and what they had produced and were very excited that they were going to be able to put their creation in the ‘place of honour’ – on top of the Christmas tree at Christmas time. 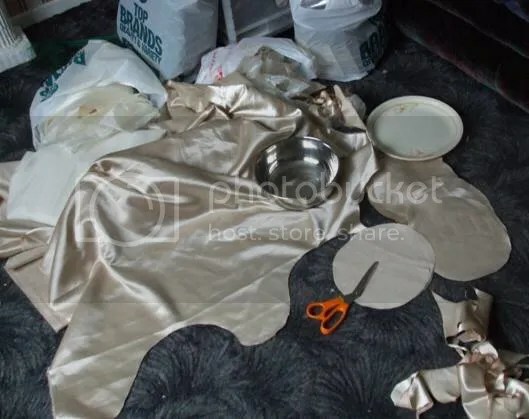 There was a lot of laughter and more than a bit of chaos as fairy heads rolled onto the floor – and floaty skirts wouldn’t lay straight – but we got there eventually! This photo shows the first batch that we made jostling for table space with their wide skirts! So – another challenge is in store for them all next Monday! 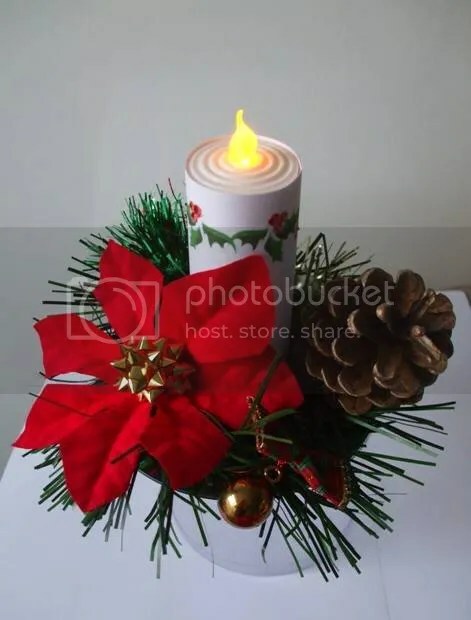 We are going to make ‘Flickering Candle’ table decorations. Last year I had thought about making something based on a candle with the group – but I couldn’t think of a way to make them look exciting without the risk of people trying to light the candle – with the obvious health and safety implications. This year I got it sorted! My son bought himself some tea-light candles from the place where he does week-end work. But they were candles with a difference! They were LED imitation candles…battery operated…and turned on and off with a switch on the base! They were so neat! Exactly the same size as a normal tea-light candle but battery operated! I was sorted! So – I began to work out how to do it. 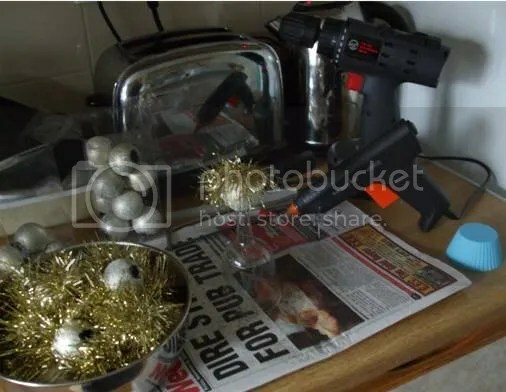 It is all based on old and out of date or damaged DVDs, CDs and computer discs onto which I have mounted – with my trusty glue gun – a thin card tube just slightly smaller than the tea-light candle. I then designed a holly pattern border and printed it out onto sheets of thin card which were then cut to size so that they were able to wrap fairly snugly round the candle, and these were then glued to make tubes. These can then be slipped over the tube stuck to the disc and when the tea-light is inserted into the top the smaller tube on the inside prevents the candle from slipping down into the printed tube! I hope you got all that!! So this allows the tea-light to be lifted out in order to turn the switch on the base on and off. I have been out for walks in the woods collecting fallen pine cones which I have sprayed with gold spray paint and have rediscovered tinsel from last year’s decorations – as well as some wire-edged tartan ribbon and some gold ribbon rosettes. 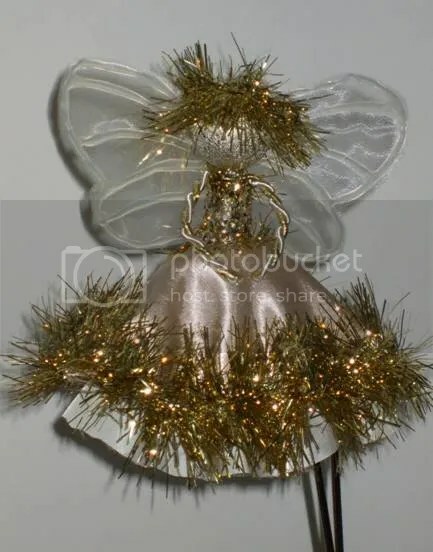 And I have been able to find in the local Pound Shop (Dollar Store) fabric poinsettia flowers, christmas tree coloured garlands and mini gold baubles! 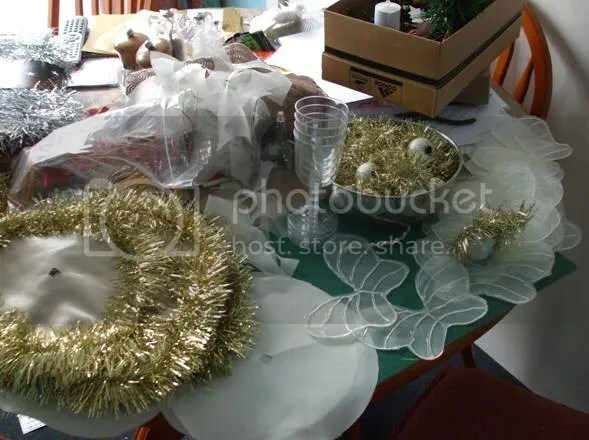 I have inserted wire into all of these decorations so that all the members of the group need to do is wire the different decorations onto a piece of the deep green garland and when everything is secure, bend the garland into a tight circle and attach it to the disc with double-sided sticky tape so that the candle protrudes through he middle of it! It is all so simple but that collection of odds and ends and woodland litter turns into this delightful little table centre! I think they will all be thrilled to make this and I am sure those candles will be flashing on and off all through Monday morning – accompanied by much laughter and chatter! My! These Monday mornings are hard work – but so rewarding! My last design for this year will be for Monday November 30th….and that still needs a bit of developing…but I’ll give you a sneak peek sometime next week!